The Iowa State Patrol says one person was killed when two trucks collided on Interstate 35 on Thursday, just north of the Iowa-Missouri border. 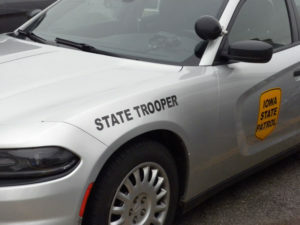 State troopers say the first truck was pulling a trailer carrying a directional arrow sign indicating drivers should merge into the left lane. A semi that was also traveling northbound on I-35 hit the truck from behind, spinning it 180 degrees, while sending the semi into the ditch, where it rolled. The semi’s driver was killed. He’s identified as 62-year-old Charles Griebel of Savage, Minnesota. The other driver wasn’t hurt.